Arduino Blog » Showing electronics in public? Be careful! Showing electronics in public? Be careful! Stahl Stenslie, Norwegian artist, PhD, and professor at the Oslo School of Architecture, has been working with the guys at 1scale1 in making a wearable device for about a year. Prototype’s last version uses an Arduino ADK together with an Android phone. It is a location based sculpture + soundscape. 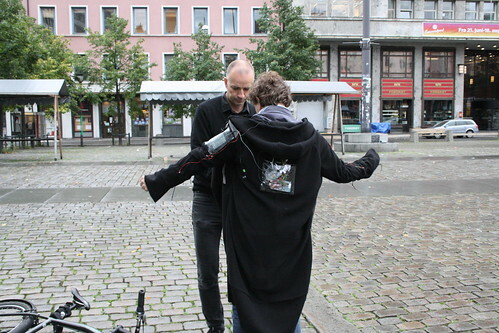 When reaching a certain place, the sound starts playing binarual sounds and an array of motors embedded in the garment, a coat in this case, will give you physical feedback. The project can be named Sense Memory […] the binaural sounds and haptic patterns were made as a response of the 22/7 terror. [They] held us in custody on the spot for half an hour, positioning themselves around and behind us as if we were expected to do something violent towards them. It was all a pretty violent experience for us. […] Interesting they would accuse us for being terrorists and potential suicide bombers. Our prime minister called for a more open society, a society with more democracy and creativity. But the police seem determined to go ahead with their own agenda. Stahl was trying out his piece together with the director of the center curating and commissioning the piece. In the pictures you can see Stahl (2m tall) adjusting the coat on his partner, how the second goes for a walk and the instant when the police comes in and stops them of testing the prototype. I have not been contacted by the police for an interrogation yet. But they said we had been reported – which again means they somehow want to punish us. The main newspaper in Norway had announced the event in an article, the day before. However, that wasn’t enough to convince the police about their non-violent intentions. Concerning the use of new, experimental media: if you want to use your handheld device, use a different design of your clothing like our haptic bodysuit or otherwise behave differently than ‘normal’ people, well, you’re most likely a terrorist. That’s the impression you get. I seriously hope court will dismiss any charges on Stahl and his partner regarding this matter. 1scale1 worked really hard in trying to put together a meaningful and enjoyable experience for the audience. It is really sad it turns out this way. Check all the pictures we got from this case clicking here. I have always wondered about what the police would think if they see devices like this. I guess we have to be careful as we are dealing with a lot of ignorance out there. Hollywood did not make it easy for us either. Showing all sort of explosive devices with glamorous electronics and explosives. I think terrorists would not walk around showing off all of the wires and devices unless they want to attract attention. You should have kept this pragmatic point in mind though. You could have put all the electronics on the inside of the coat, but I guess you wanted this to be a peace of art was well as a functional coat. While I don’t like the way you have been treated, the police actions were expected. They just can’t run the risk. There is a fine line between genius and devious. It all depends on your intentions. No one has a device to test that though. I wonder if it would be a good idea if one can get some sort of an official letter from a police station of some authority with the picture of the contraption to show to any policeman that may stop you later on. But for now, I guess you are right. Be careful! Two months ago a bomb blast ripped through Oslo killing 8 people. 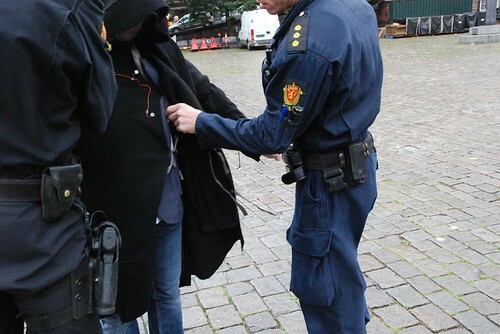 You are surprised when the police stop you because you have wires coming out of your coat? I understand why the author is upset… but I also see why the police acted in the way they did too. The Norwegian people have a strong tradition of supporting, and fighting for freedom. As some of you may know, the paperclip was invented in Norway just over 100 years ago. During World War II, when the Germans occupied Norway, many brave Norwegians would wear paperclips on their lapels as a sign of defiance against tyranny. Today I will be wearing a paperclip in support of Stahl Stenslie and freedom of expression for people everywhere. I would encourage everyone to do the same. In many areas of the world they would have just shot the person and asked questions later.